Proximo: Congratulations, you have very persuasive friends. Lucilla: My brother's had Gracchus arrested. We daren't wait any longer. We must leave tonight. Proximo will be here t midnight and take you to the gate. Your servant, Cicero will be waiting there with horses. 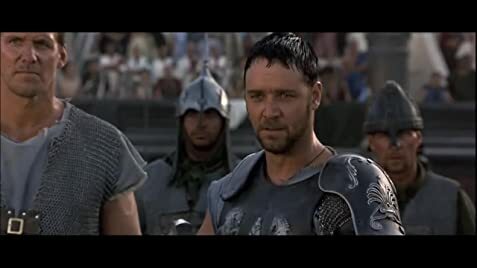 Maximus: [sighs] You risk too much. Maximus: You have nothing to pay for. You love your son, you are strong for him. Q: Which scenes used CGI to replace Oliver Reed? The epic blockbuster returns with the 21st Century's answer to Cecil B DeMille, Ridley Scott and his dramatic tale of courage and revenge, GLADIATOR - "the general who became a slave, the slave who became a gladiator, the gladiator who defied an emperor". Once a great roman General, and as good as adopted son of Marcus Aurelius Caesar (Harris), Maximus (Crowe) is forced into exile by Commodus (Phoenix), heir to the throne, after the death of Marcus. Saved from death by slavers, he is purchased for use as a gladiator by Proximo (Reed) and ends up in the arena of all arena's, the Colloseum, where he proves unbeatable under his guise as "The Spaniard". And with a budget of over $100m, Scott certainly delivers the goods. 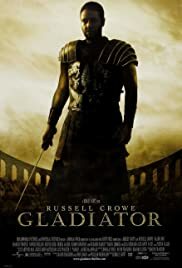 GLADIATOR transcends the notion of 'blockbuster' that we have become accustomed to in the age of electronic and special effects wizardry and instead offers a good old fashioned action film along the lines of Spartacus and and Ben Hur. Not only are we drawn into an archetypal story that contains all the classic elements a filmgoer could dream of (love, loss, courage, despair, good triumphing over evil etc etc) - also on offer is a visual feast of cinematic painting after painting - a rich tapestry of images that are breathtaking and ultimately visually satisfying. From the plains of Germania, to the desert stronghold of Zuchobar, and finally to great Rome herself, John Mathiesion, the cinematographer is to be commended highly for his general inventiveness and ability to capture so much on film. The opening battle scene is superb as a cast of thousands erupt across the screen and provide an indication that we are about to see a film that pays incredible attention to detail throughout its entirety. In every way, Scott has created a world for us that scuttles films of similar epic undertakings (and budgets!) and sends them to their dooms at the bottom of the murky depths of film history where they belong. The cast is generally very strong. Crowe proves himself very suitable to the task with a great emotional range and depth of character. His accent ocassionally bugged me (as did the mish mash of accents on offer - but that is I guess a legacy of 'internationally casted films'), but this aside, he was well and truly up to the task. Phoenix is also excellent as the disturbed Commodus, as is Nielson as Lucilla, the daughter of Marcus who "should have been a son" and finds herself torn between loyalty to her brother and doing what is 'right'. The old guard thesps of Harris, Reed and Jacobi (Grachus) are uniformly strong as supporting characters, and Spencer Treat Clark (Lucius) does a fine job as the young heir to the throne. Add to this great cast excellent editing and post production work, and an intricate soundscape (including a magnificent Hans Zimmer score), and you have a film that, despite its length, was highly palatable and had me in there from beginning to end. A must see. 165 of 221 people found this review helpful. Was this review helpful to you?